This beautiful skeleton bride (ONE BRIDE ONLY) is all dressed up for her wedding. She is wearing a lovely lace veil with white roses bordered in gold glitter. Her delicate lace skirt is ornamented with additional silver sequins, and she is holding a vivid bouquet of fuscia roses. I sewed the doll from soft black Ultrasuede and added the sequins, beadwork, recycled lace, and embellishments by hand. Size: app. 5.25” tall and 1.5” wide at base. 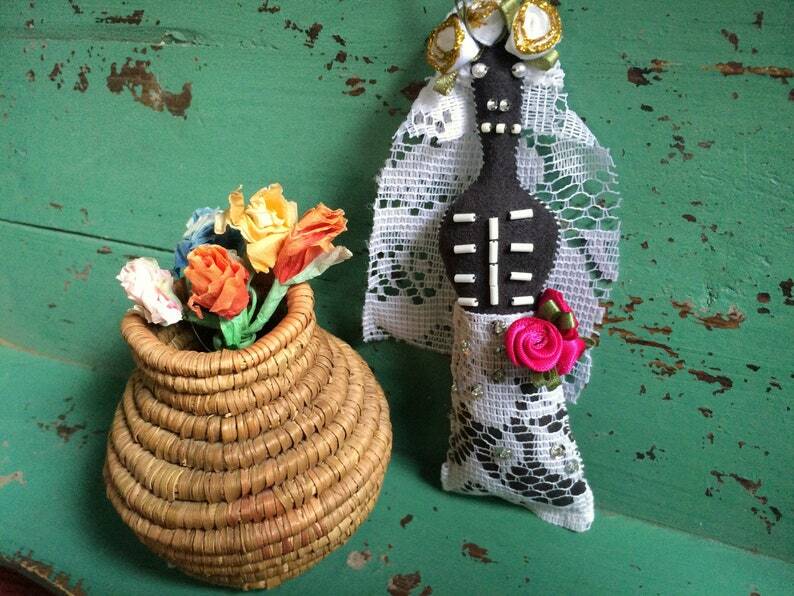 These Day of the Dead art dolls celebrate marriage equality and can be mixed and matched in any combination: bride and bride, bride and groom, groom and groom, for a truly unique wedding present. Each listing is for one art doll, so place two orders if you want a set (any combination, your choice!). 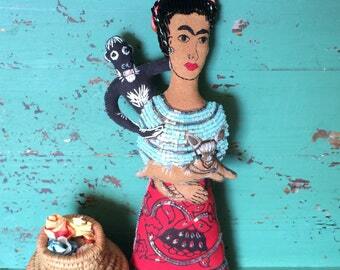 These are perfect gifts for folk-art lovers, unconventional couples, or friends with quirky senses of humor! NOTE: The bride pictured in the listing is not necessarily the exact one that you will receive. Each bride varies slightly due to the handmade process, and if you would like an exact picture of the bride you will receive, I will be happy to send one upon request.